This puller is typically used with an extruder or other machine that produces plastic layered tubes or solids in various diameters. Co-extruded plastic covering a base core or tube can be precisely sized using a hot die. A sub surface wire braid can be tested for exposed wires and any exposed areas cut out. Good product is then cut to a selected length. The hot die is located between the two independent pinch drives. Each pinch drive is electronically geared to either a programmed speed or an input from an upstream size feedback (like a laserMike). 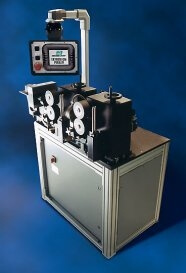 The speed ratio between the two pinch drives can be adjusted through the touch-screen operator interface to control process slack. Exposed wires are detected using a high voltage tester. Air cylinders move the drive and process elements out of the way for easy setup. By improving the accuracy of all controlled parameters, this machine can increase productivity through reduced rejects and faster processing speeds. The programming is flexible to allow new products to be made with the same machine. With the availability of better technology, product designers are finding they can build better products.